Honors College has raised $ 12,577 from 67 gifts! 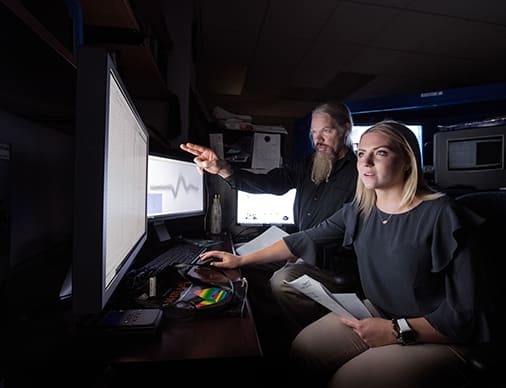 The research that Molly Layne does with Dr. James Lewis on vocal sounds and the brain may be used to improve hearing aids. Our students won fellowships for research, traveled the world and contributed over 27,000 hours of community service. • The Undergraduate Research Office offers unparalleled opportunities to all students to pursue knowledge under the mentorship of renowned faculty. • The ASPIRE Office provides support for students who want to apply for graduate school and/or nationally competitive scholarships and fellowships such as Rhodes, Fulbright, Goldwater and Truman. • The Pre-Health Professional Development Office allows for rigorous preparation for students who plan to apply to medical, dental or other professional schools. In August, we welcomed yet another record class of incoming Honors College freshmen, with more than 1,000 students (approximately 20% of the freshman class). In fall 2019, we will launch Honors EXCEL, which transforms the last two years of Honors into an immersive experience that allows students to apply their knowledge way beyond the classroom – into research or creative work; interdisciplinary creations; internships and co-ops; community engagement; and/or study abroad experiences. Your gifts will be used to help these high-achieving students realize their potential while making a difference in our community, our state, and even the world. We encourage you to support the Mountaineer spirit by giving to one of the listed priority funds. With the ever-increasing need for scholarship assistance to help reduce student loan debt, a gift to any scholarship fund in the Honors College is greatly appreciated. • Provides opportunities for academic exploration and experiential learning activities, including further development through living and learning communities. • Gives assistance to students to allow them broader access to recruitment, networking and professional preparation opportunities on and off campus. • Helps students take advantage of shadowing, research and internship opportunities that enhance their applications to health professional schools. • Supports tools for research, travel expenses and conference fees to support undergraduate presentations, costs associated with research publication and activities of the office to promote undergraduate presentation opportunities. Former Foundation Scholars Catherine Goffreda Bailey, Kathryn Clay Fisher, Ryan McCarthy, Alyssa Sloan, and Danielle Waltz will match every dollar donated by current and former Bucklew and Foundation Scholars and current and former Honors College students, up to a total of $1,000. Please help us meet this match today by making a donation to support our area of greatest need, the University Honors Program Fund. Former WVU Honors student and Foundation Scholar, Matthew Schessler, and his wife, Elizabeth, will match all gifts received for the Dr. William & Karen Collins Experiential Learning Endowment fund, up to $750. Dr. Collins is a former Director of the University Honors Program. Please help us reach this goal by making your gift today. Former Director of the Honors Program, Bill Collins, and long-time Office Administrator, JoAnn Evans, will match all gifts, up to $600, to support our area of greatest need, the University Honors Program Fund. Please help us meet this match by making your gift today. The first 10 gifts made on WVU Day of Giving to the Honors College Greatest Needs Fund, will unlock a $500 donation from Dean Ken Blemings.